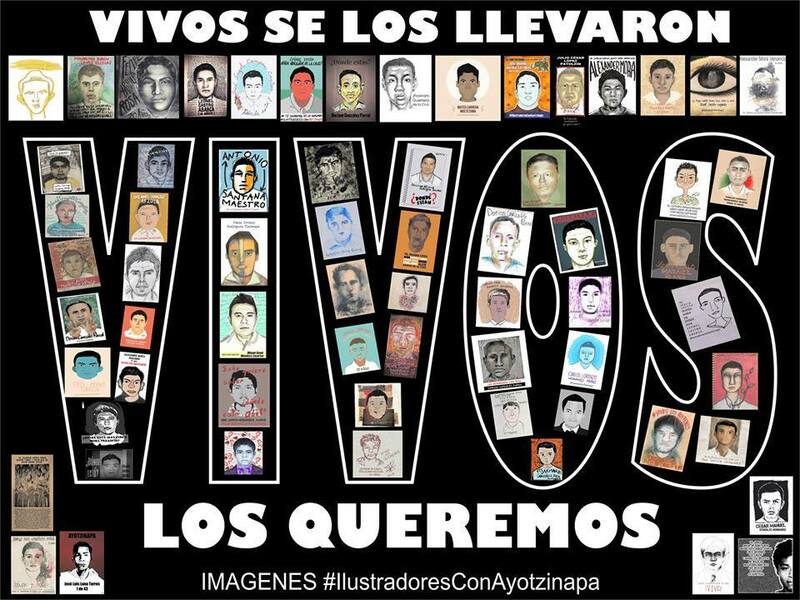 These are the names of the students from the Rural Normal School of Ayotzinapa who were disappeared by the municipal police of Iguala and Cocula. They are the same people whose faces appear by the thousands on the banners and pieces of canvas that students and citizens carry at all kinds of protests, demanding that the authorities return them alive. What strange irony. After being separated from national public life for years and appearing from time to time in the media as an educational vestige of the past that needed to be eradicated, the rural normal schools are right in the middle of the debate today. The tragedy of Ayotzinapa, a rural normal school, has shaken the national conscience, taken students from public and private universities out into the streets in almost the entire country, and brought about the most serious political crisis in a long time. The demonstrations that show solidarity with the normal school students never stop. Every day new forces join: religious representatives, artists, intellectuals, athletes and unions. The attempt of the broadcast media to contain, minimize and distort the meaning of the protests has failed. Why has this particular tragedy brought about such feelings of indignation? Because it was the straw that broke the camel’s back, as was the murder of poet Javier Sicilia’s son, at a different time and on a different scale. On this occasion, both the stories of police brutality against a group of poor boys, harassed and unarmed, and the image of the pained parents have touched other parents, who see in these events something that could have happened to their children. This creates instant identification and works as a linking element for the social discontent that up until now has been scattered. The suffering and agony of those parents brings together the uncertainty and insecurity that many citizens experience in many regions. In the story of the normal school students, we discover the feeling of vulnerability brought about by being a young person in a country where young people are recurring victims of the violence of the government. In the story of a mayor who was allowed to escape, we see evidence of the pact of impunity that protects the political class. But that pain and that rage, that fear and that longing for the young people to return alive has its hard nucleus, its source of legitimacy, and its network of protection in a community fabric that is elusive to the techno-bureaucracy leading the country. That network is the one that gives the social mobilization the source of moral authority currently expanding throughout the society. 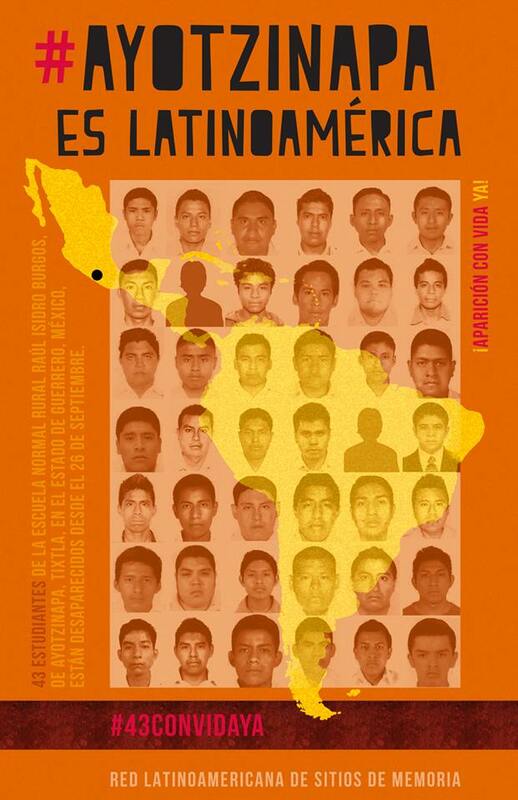 Yes, they are not just 43 missing young people. Behind them are more than forty hurting parents and their extended families, mostly with very few resources, who spend their nights awake waiting for their children to appear. Alongside them are many communities, almost all rural, begging for the safe return of their neighbours. Shoulder to shoulder, about 500 students from the Raúl Isidro Burgos Rural Normal School march, awaiting the return of their schoolmates, whom they sit by and share dormitories with. As if they were an army, thousands of graduates, who are deeply committed to the school that allowed them to get ahead in their lives, accompany them, many of them working in the most remote towns of Guerrero. These graduates take what has been done to the young people as a personal attack. At the forefront are about 8,000 students from other rural normal schools, connected to them long before tragedy arrived in their lives. The rural normal schools make up an imaginary community, comprised not only of the students that study in their classrooms and live in their dormitories, but also of the students’ towns, the agricultural worker groups they work with in school internships and the communities where their graduates go to work. The current teachers who graduated from within their walls are an important part of it. For all these people, what happens there concerns them. The rural normal schools are one of the few means of social mobility that young people in rural areas have. The future they make for themselves thanks to their studies has an impact on the lives of the communities. What happens there is important to them. They are theirs: they are a living legacy of the Mexican Revolution, an inheritance of the rural school and the [Lázaro] Cárdenas presidency [1934-40], which they are not willing to give up. The students who are taught in those schools are also part of one of the oldest student organizations in the country: the Federation of Rural Socialist Students of Mexico (FECSM). Founded in 1935, it has played a fundamental role in the survival of the rural normal schools, which are pestered relentlessly by educational authorities and local governments. Its directors are students with good behaviour and an average grade of no less than eight [out of ten]. Only the best students represent their classmates. The leaders are young people with political training, analytic abilities, organizational skills and a vision. That community, made up of many different generations and communities, is the one that has kept the rural normal schools from being closed in the past. It is the one that has resisted the aggressions against it. It has made the survival of the project possible. In the disappearance of the 43 normal school students from Ayotzinapa at the hands of the police, that community sees a serious affront that requires a response. 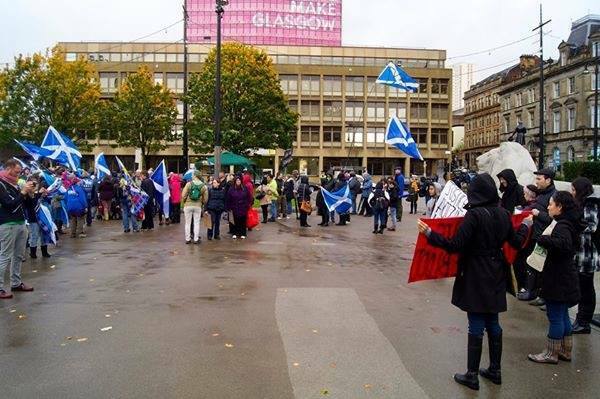 It takes as mockery the fact that the government is not making the location of the young people clear. It becomes indignant before the attempt of the authorities not to make the legal truth coincide with the historical truth. It, with all of its moral authority, calls on the rest of society to join the fight. It demands, with never-ending rage and determination, that its children appear alive. Protego ergo obligo, Hobbes wrote. In nation-states, the protection governments give to citizens creates citizen obligations. No one today would argue that the Mexican government is protecting its citizens. It is the opposite; it even robs them of their autonomous protections. Despite their cynicism, officials are being forced to disguise with all sorts of euphemisms their failure to perform their principal function. Noncompliance is not exemption. The fact that the government does not fulfil its obligations does not mean that we cannot, indeed, we must, continue demanding that it do so. 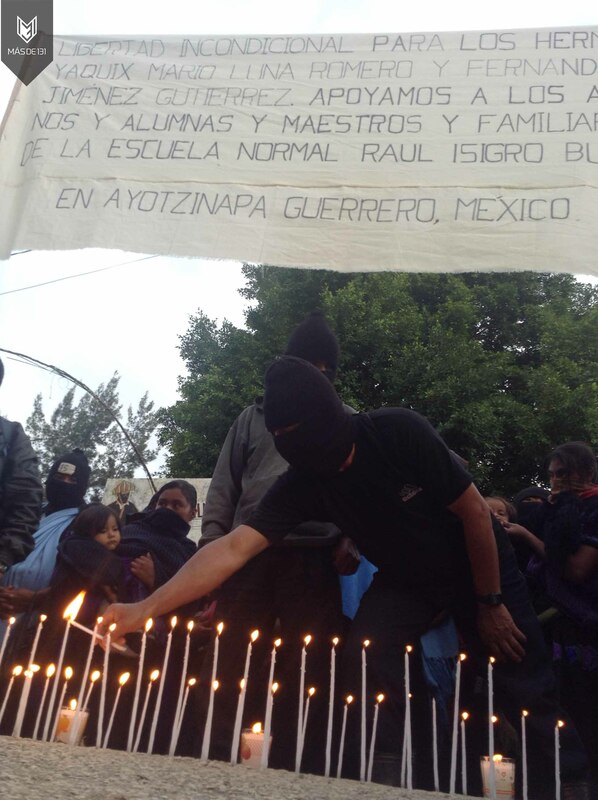 The current slogan of the demonstrations includes the increasingly faint hope that they must return them [43 students disappeared in Iguala, Guerrero] alive, but it is above all a denunciation: we know that they took them. They must accept the consequences. There are solid grounds behind the general desire to see the mayor of Iguala, his wife and the governor in jail. But the federal government is using these legitimate and well-founded sentiments as an excuse to avoid its own responsibility. Raúl Zibechi is right: “The state has become an institution where the narco criminal and politician merge to control society” (ALAI Amlatina, 24/10/14). 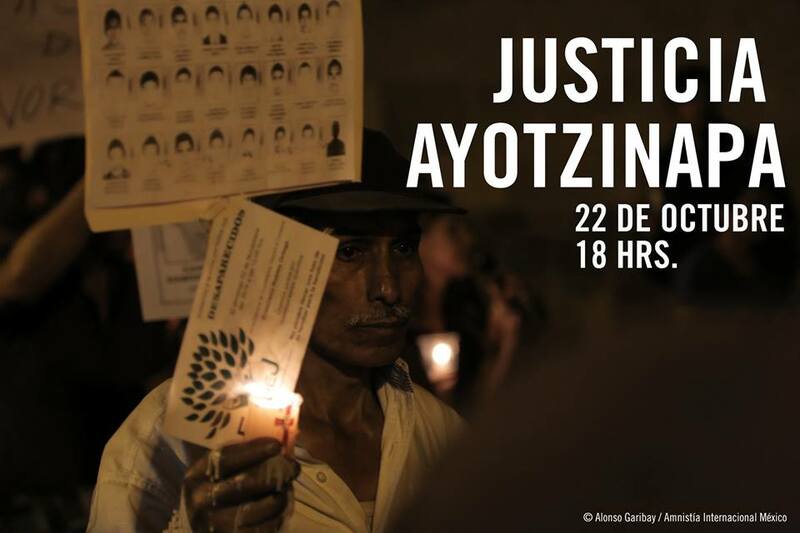 There was both action and neglect by the federal government in the crimes of Ayotzinapa, and it is complicit in many of the crimes that have been committed in Guerrero and the rest of the country. Whether or not this is legally shaky ground is the responsibility of the established authority. But instead of legal instruments suitable for revoking the mandates of elected or appointed government officials and terminating their impunity, they formulate and implement laws to protect themselves and to control and punish citizens. Make no mistake. As Javier Sicilia said long ago, we are as completely fed up with government officials as with the criminals. As he also says, and as Francisco Toledo repeats, we are left speechless before the level of degradation that has now arrived. We are before the mystery of Evil, which cannot be reduced to sociological or psychological causes. But we cannot close our eyes. The fact is that we are suffering all sorts of crimes and a growing barbarism, such that it is no longer possible to distinguish [barbaric acts] committed by career criminals and amateurs from those that are the direct responsibility of government functionaries at all levels. This is the state at which we have arrived. 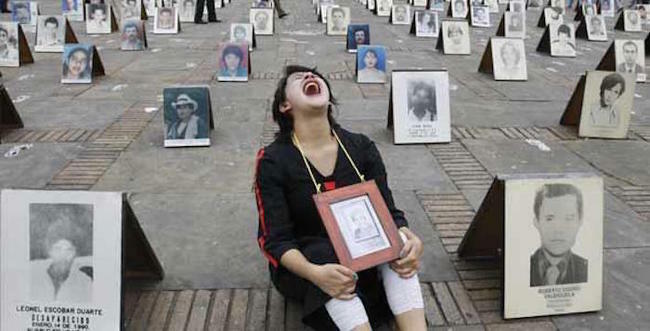 Given the gravity of the events surrounding the government/cartel killings and forced disappearances of students and civilians in Iguala, Mexico, on September 26 and 27 of this year, Frontera NorteSur is devoting special coverage to the growing repercussions of the Iguala Massacre, which some observers now compare in its possible impact on Mexican society to the 1968 student movement and Tlatelolco Massacre. Below is a summary of some of this week’s major developments. 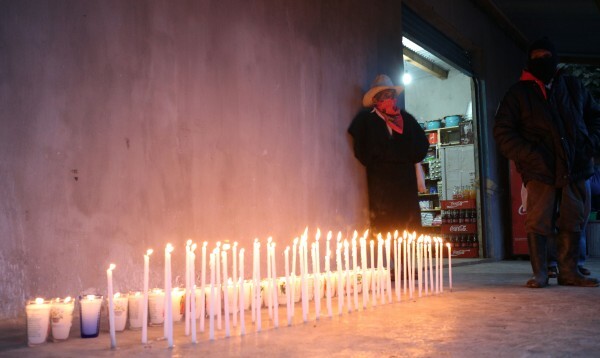 Public outrage over the police murders of six people and forced disappearances of 43 students from the Atoytzinapa rural teachers’ college in the southern Mexican state of Guerrero continued to snowball this week. Parts of the Mexican Republic were virtually paralyzed by a 48-hour protest convened October 22-23 by student, labor, farmer, and social organizations. Significantly, actions ranging from the shut-down of university campuses and the takeover of government offices to the blockade of highways and international border crossings extended from the traditionally “politicized” zones of Mexico City and southern Mexico to many nooks and crannies of the country. The Mexican press reported actions in at least 18 of the nation’s 32 states, including usually less politically active entities like Colima and Nuevo Leon. On the evening of October 22, and for the third time this month, hundreds of people temporarily blockaded the Bridge of the Americas between Ciudad Juarez, Chihuahua, and El Paso, Texas. In a march that wound from Borunda Park to the border crossing, protesters shouted out the names of the 43 disappeared students and plastered pictures of the missing young men at the local headquarters of the federal attorney general’s office. “To seek a better education is not a crime” and “There are not enough bullets to kill us all” were among the messages spotted on signs. Young people formed the vanguard of the protest, with participating students from the Autonomous University of Ciudad Juarez, Autonomous University of Chihuahua, Technological Institute of Ciudad Juarez and the Ricardo Flores Magon Rural Teachers College of Saucillo, Chihuahua, a sister institution of the Raul Isidro Burgos Rural Teachers College in Ayotzinapa. The women students from the Saucillo school have been at the forefront of advancing the cause of the Guerrero students in Ciudad Juarez and other parts of Chihuahua state. Among numerous actions, an estimated 15,000 people demonstrated in Guadalajara, Jalisco, while 40,000 students joined in shutting down institutions of higher learning in the neighboring state of Zacatecas. For the first time in its 180-year history, students shuttered the University of Guanajuato Law School in protest. 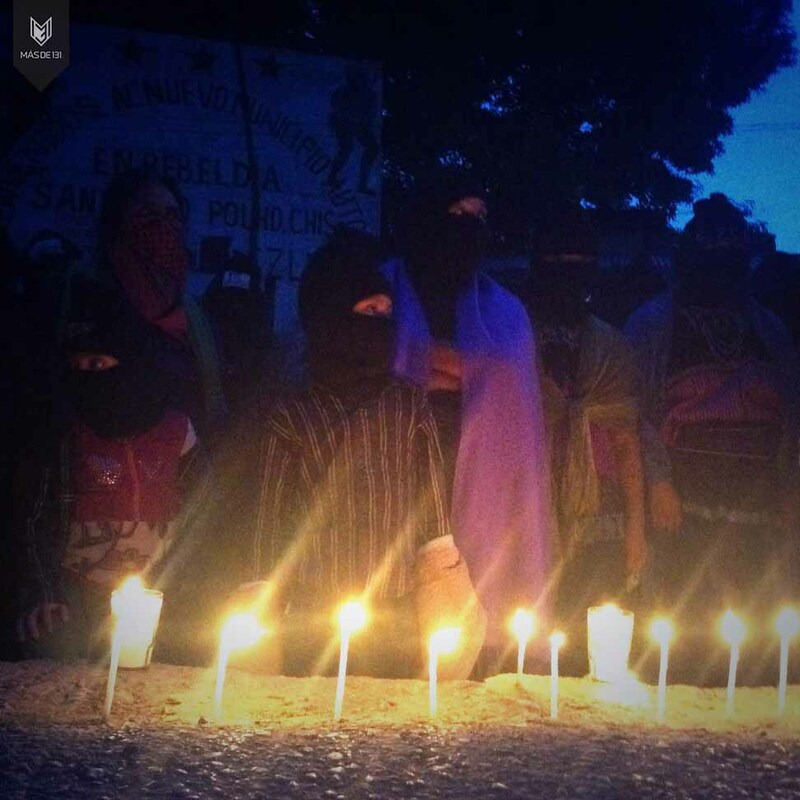 Meanwhile, in the southern border state of Chiapas, indigenous Zapatista communities lit candles for the Ayotzinapa students. In Mexico City, tens of thousands of students from public and private universities made up huge sections of a march through the capital city. “No violence, no violence,” chanted students from the University of Chapingo. Interviewed prior to the march, an activist involved in the massive student strike for institutional democracy and accountability, public education and professional integrity still underway at Mexico City’s National Polytechnic Institute (IPN), voiced the heart-felt burst of solidarity with the Ayotzinapa students that is sweeping Mexican university campuses. In Guerrero the movement got a jump-start on the rest of the country as teachers, students and the citizenry in general began occupying nearly two dozen city halls in different regions of the state early in the week. 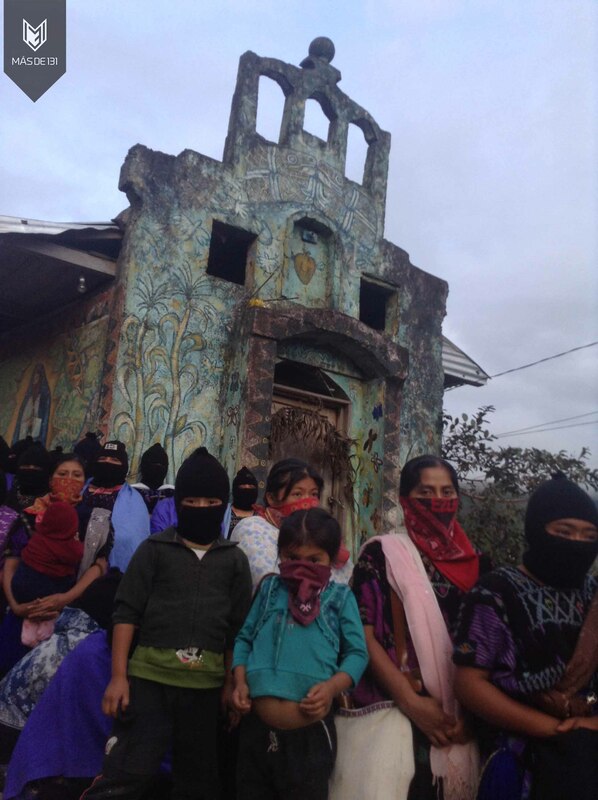 In Tixtla, thousands of people supported by armed members of the indigenous-led community police effectively took over the small city located near Ayotzinapa. By week’s end, protesters led by the Guerrero State Coordinator of Education Workers and Popular Guerrero Movement occupied Acapulco’s city hall for an “indefinite” time. On October 22, between 10,000 and 20,000 people demonstrated in Iguala, the scene of the September 26 crime, garnering enthusiastic support from the residents. A small group of young people broke away from the crowd and set Iguala’s city hall ablaze. Across Guerrero protesters demanded the safe return of the Ayotzinapa 43, punishment for the authors of killings and disappearances, medical attention for victims wounded in the September 26-27 attacks, and the ouster and trial of Guerrero Governor Angel Aguirre, whom protesters hold responsible for the violent circumstances prevailing in their state, now considered as the most violent place in the country. As the week drew to a close, the protesters got part of their wish: Governor Aguirre announced he was requesting a leave of absence from office, in a move just short of outright resignation. 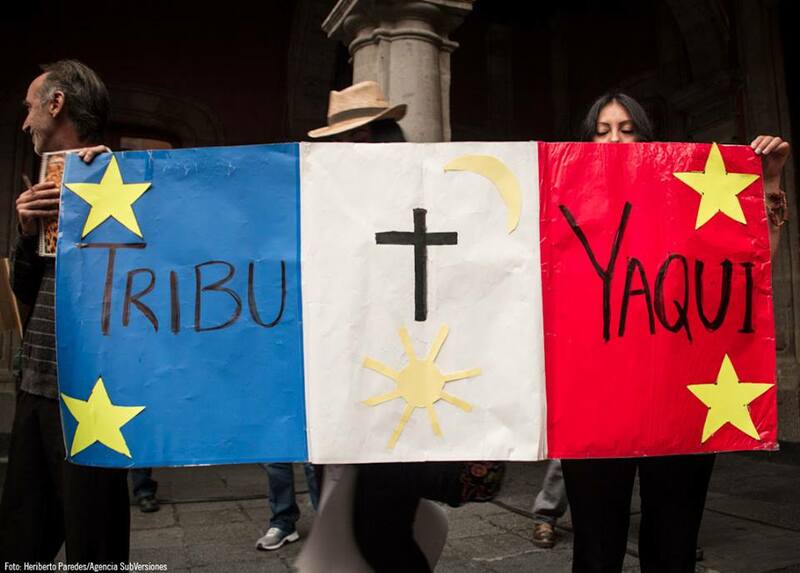 Internationally, members of Mexico’s vast diaspora and supporters staged demonstrations for justice in London, Paris, Helsinki, Copenhagen, Madrid, Barcelona, Florence, Bogota, La Paz, Los Angeles, and other cities in at least 15 countries. 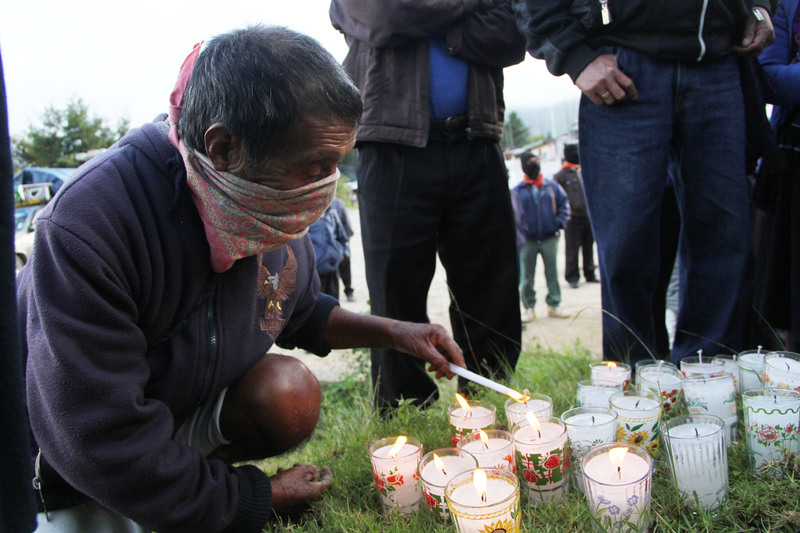 On October 24, activists in Santa Cruz, California, plan a vigil for Ayotzinapa. But nearly a month after last month’s violence, it is still not confirmed if the dozens of charred corpses subsequently discovered in multiple, so-called “narco-graves” on the outskirts of Iguala belong to the missing Ayotzinapa students. Pushed by Federal Attorney General Jesus Murillo Karam and other government officials, several versions exist (disputed in part by Atoytzinapa attorney Vidulfo Rosales Sierra) of why the students, who were in Iguala collecting monetary donations from the public in order to be able to attend the annual commemoration of October 1968 Tlatelolco Massacre in Mexico City, were so viciously targeted by municipal police and Guerreros Unidos cartel gunmen in the first place. Implicated as the authors of the violence, now-fugitive Iguala Mayor Jose Luis Abarca and his wife, Maria de los Angeles Pineda Villa, who has been identified as the sister of founding members of Guerreros Unidos, were reportedly incensed at the Ayotzinapa students’ presence in Iguala while a ceremony and dance attended by the couple was in progress on September 26. Consequently, either Abarca or his wife- or both- ordered that a harsh lesson be given to the young people. A related explanation for the mass abduction that climaxed the police shootings of the students and passing members of the public is that corrupt city officials and Guerreros Unidos made a monstrous misjudgment in confusing the students with “Los Rojos,” a rival organized crime group. So far, more than 50 people have been detained in connection with the violence, including Iguala policemen and alleged Guerreros Unidos members, according to Attorney General Murillo. In comments about this week’s political upheaval, President Pena Nieto reiterated his government’s commitment to locating the missing students and applying justice. “The President of the Republic makes the sentiment of indignation his ownŠ,” Pena Nieto said. While the Iguala atrocities are far from unique in Mexico, the September 26-27 violence has perhaps no better exposed in one fell swoop the collusion of government and organized crime, the criminal infiltration and corruption of political parties, the cold hand of official repression, and the incapability or disinterest of the state in guaranteeing the security of its civilians. 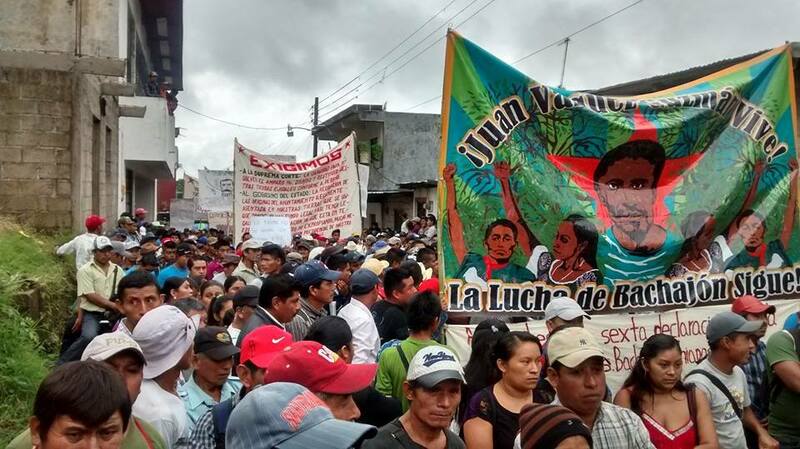 A central message of protesters this week: Iguala was a crime against humanity committed by the state. Analysts and commentators of all stripes weighed in on the turmoil. 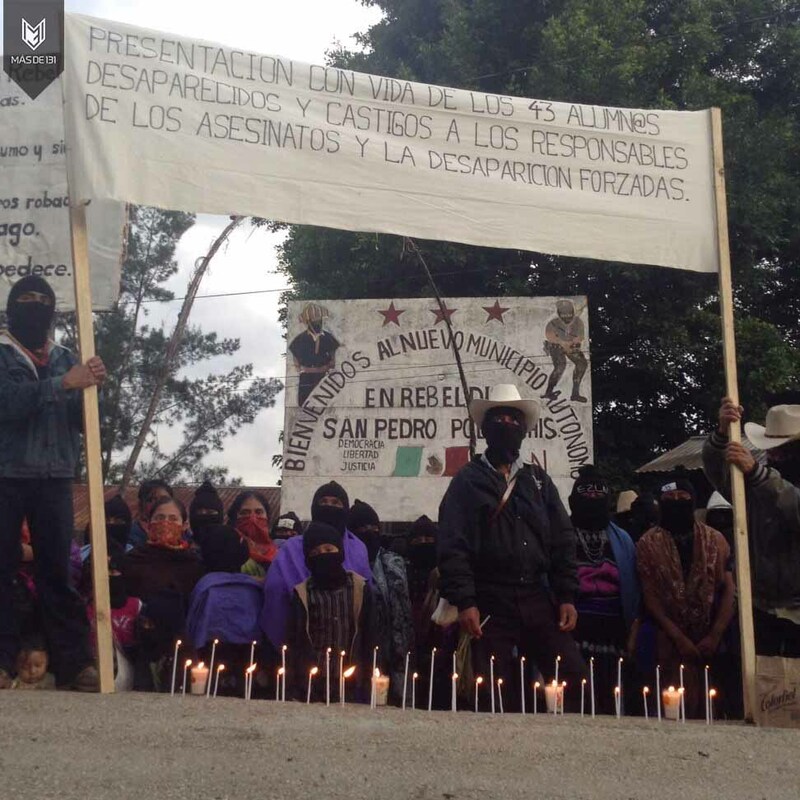 “Preceded by the scandal around the (June 30) firing squad execution of 22 people by the army in the Mexico state village of Tlatlaya, the case of the disappearance of the 43 Ayotzinapa students turned on its head the government of Enrique Pena Nieto, which was acting triumphant because of its structural reforms- especially the energy one- and that were displayed abroad as a modern and vanguard government,” wrote Proceso’s Jose Gil Olmos. Columnist Jorge Ramos, the star broadcaster of the Spanish-language television network Univision that is beamed into millions of U.S. households, was no less poignant in a column this past week. “The dead of Mexico can no longer be hidden. The massacres of Tlatlaya and Iguala show the worst of the country: the army massacring civilians and the police murdering students. This is Barbarous Mexico. And the government of President Enrique Pena Nieto is almost deaf, paralyzed and overwhelmed, as if the fault was not its own,” Ramos wrote. Ironically, the outcomes of the massacre in Iguala, the very place where Mexico’s independence from Spain was formalized in 1821, could well lead to a new day for the nation-or its demise. As one Ciudad Juarez activist remarked to FNS, the great challenge of the youth and popular uprising of October 2014 will be to maintain the grassroots momentum while organizing and articulating the movement in a way so genuine, lasting changes result. 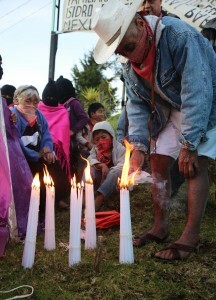 Alejandro, indigenous Tsotsil, is imprisoned unjustly in CERESO 5 in San Cristobal de las Casas. Mario, Juan Antonio and Roberto, Tseltal indigenous, are prisoners for political reasons. “Revenge of the police”, say his family. They have just been transferred to CERESO 12 in Yajalón. A heavy blanket of fog and rain drowns the mountains from the north to the highlands of Chiapas. Despite the heaviness with which the huge threads of nature tie the soul, the walls raised by humans are more terrible. However, a profound word is emerging from the voice or the pen of the prisoners, and there is no density or wall that can stop this voice. Two years ago he could not speak Spanish. Now, as we have documented in Másde131, the indigenous Tsotsil Alejandro Díaz Sántiz is responsible for publishing reports on the situation of the inmates of CERESO 5. “Do you write this for the students of Ayotzinapa?” I ask. “The government itself does that,” he replies. Remission of sentence is one of the last tools that Alexander has to obtain his release. His lawyers filed on October 16 that the government of Veracruz accept and order his release on account of his work and conduct in prison. He now has to wait for that information from the state government of Chiapas. The answer could take two weeks after it was filed for legal recourse. On 11 May, Sántiz Diaz completed a period of 15 years in different prisons, from Veracruz, where he allegedly committed the crime of murdering his own daughter, to now in CERESO 5. I keep thinking about what Alejandro said on a previous visit, that he always wanted to struggle, that he wanted to be Zapatista since childhood, that now he can be an adherent to the Sixth in prison. He fulfilled his dream overcoming his fear of speaking, writing, expressing himself. A compañera brings him a song. I tell Alejandro that now we are going to leave him a letter to set to music. He smiles and says yes, if he can. “Why do not you weave hats and bracelets, Alex?” I asked a month ago. “I do not have time, now I have to write a lot,” he replies. Neatly, slowly, he begins to write a few lines for me to take out of prison. Then, he accompanies us to the exit. We learn that this October 24th he will spend another birthday in prison. All have gone, I stay until the end. I raise my left arm, close my fist, show him what it says in my notebook. 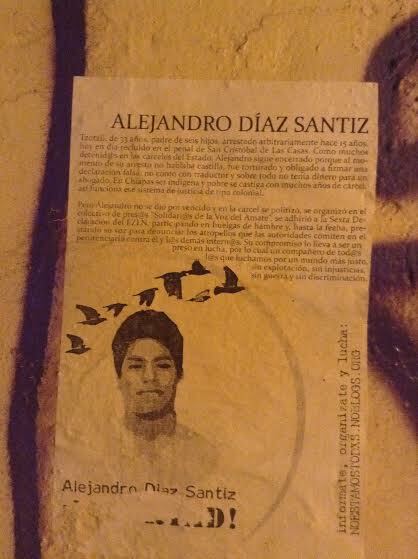 Alejandro Diaz Santiz also raises his left arm and makes a fist, a ritual that we have woven without talking since I first met him, a series of words between the eyes and hands to be repeated until I see him get out of prison. The road to CERESO 12 Yajalon, where the three Tzeltal prisoners from San Sebastian Bachajón are held, is steep and curving. In Ocosingo, where there was heavy fighting between the EZLN and the army in 1994, the water forms small streams on the pavements. This does not erase our memory, in contrast, it reawakens it. The journey is expensive. Sixty pesos from San Cristobal; another sixty from Ocosingo. The whole situation has a high cost for the families of the prisoners who we meet after entering the prison. “This is costing us a lot, compañeros. It is costing us a lot. Sometimes we despair. We have the idea, but we do not know if we can do it,” they say when thinking what the possibilities are to get their three prisoners out of jail. “Today is only the day for family visits, but as you have come from far away we will let you in,” says the man in charge of the visitor’s book. This is extremely unusual, usually the watchword of the wardens and directors is to hinder visits to political prisoners. Juan Antonio, Roberto and Mario, sitting in that order, are on a bench in the courtyard of the prison, full of looms for weaving hammocks. The first thing that strikes you is something that a compañera had told me: “They are very young”. Nineteen, twenty and twenty-three, surrounded by their families, they look down. We do too. It is hard to know what to say, even when it is already agreed that each will make a presentation. That is why I am here. “Help me to get my freedom. I have a wife and son, I cannot support them in here,” says Roberto. He cannot explain in a way other than with anger and powerlessness. His tears appear, want to fall and then pass. Juan Antonio, Roberto and Mario tell how they were at the celebration of September 15, when early in the morning they and other young people from Bachajón were stopped by members of the police from Chilón who pointed out Juan Antonio. They went against the three of them, detained and tortured them. Mario looks up suddenly, sadly. I notice a huge scar above his lip. We are left again not saying anything. It is as if we were all under sentence. Not shame, but a punishment that can hardly be expressed in words. Meanwhile, the other prisoners carry on weaving, looking at us sideways curiously. They dragged Juan Antonio along the ground. His face is still scraped. They kicked him hard on the head. Blood came out of his ear. He has a headache. He is the brother of Juan Carlos Gomez Silvano, who was a coordinator of the adherents of the Sixth until he was assassinated last March by the Chilón police. According to the three young men, their families and various communiqués released by the adherents to the Sixth Declaration of the Lacandon Jungle, the arrests were made in retaliation for the capture and subsequent imprisonment of the police officer Sebastián Méndez Hernández in the prison of El Amate. An order of imprisonment for attempted homicide was the verdict of Omar Eleria Reyes, mixed trial judge in Ocosingo, issued on September 24 against Juan Carlos, Mario and Roberto, reclassifying the crime and leaving them no possibility of bail. “My vision is dark, my sight is cloudy and I have to wait. Afterwards I recover,” says Roberto. The health situation of the three concerns their family members, they may have internal injuries. “Here it is quiet,” says Roberto. Juan Antonio, Roberto and Mario continue to rest on their arms. We ask what colour thread they need to start weaving: green, blue, red, yellow. On leaving we look at their faces. My hand just touches the arm of Roberto. Again there are unshed tears, we look away. A tangle of wires spills water over the hills of Yajalon. We say goodbye. It has started to rain. Outside the prison is a sign that says, “Movement for the Defence of Territory: No to the Highway from San Cristobal to Palenque”. We are charged with bringing in threads to weave, and bringing out their own fabric of woven words. A light blanket of fog and rain begins to cover the valleys, canyons and mountains of Chiapas. It seems that the water from the sky gradually forms a wall to make the territory into a giant prison of the mind. However, we carry on single sheets the means to climb over any wall: The woven fabric of the word. Tuxtla Gutierrez, Chiapas. 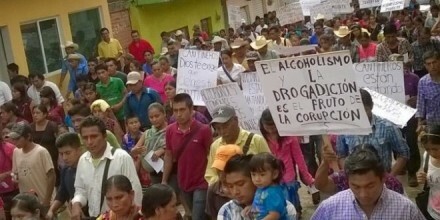 – Once again, parishioners of Simojovel who are members of the Believing People organization denounced that, like in Iguala, Guerrero, their municipality is governed by corruption and that behind the refusal by Mayor Javier Hernández Guzmán to close the bars of the municipality, there are big interests, such as drug trafficking. In a communiqué, the Tsotsil Indians denounced that recently not only has the number of bars increased, but also the sale and purchase of drugs, prostitution and the death toll from alcohol. Members of the Believing People, attending the parish church of St. Anthony of Padua, led by Father Marcelo Pérez Pérez, said that they are living in a critical stage due to the abandonment of Simojovel, which is internationally recognized by the mining industry for its amber, which is marketed inside the country and even exported to other countries. 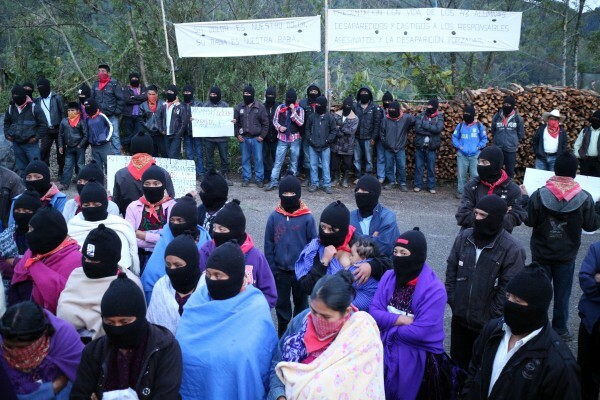 They denounced the growing insecurity in this municipality in the highlands of Chiapas, which has generated a wave of violence, murders, thefts from roads and houses, and assaults on the streets, plus you constantly hear at night bursts of gunshots in different neighbourhoods. They also expressed concern about the appalling condition of the road from Puerto Caté to Simojovel. “Here in Simojovel, our sick die before their time because of the inhumane conditions at the health centre,” they said. And they explained that through pilgrimages, most recently on Saturday 18th, they have demanded that the local, state and federal authorities look at what is happening in Simojovel to enable peace among its inhabitants who are experiencing days of anguish. According to the protesters, even the priest has fallen victim to the local authorities and the power groups in this municipality. A two metre long narco-banner was found in the early hours of October 16. It appeared on the rear fence of secondary school number 3 in Iguala, Guerrero, less than one kilometre from the 27th infantry battalion. On it, in a message written with letters printed in red and black paint, El Choky asks President Peña Nieto for justice. He denounces, with (first) names, last names and pseudonyms, those responsible for the murder and disappearance of the Ayotzinapa students. The state’s attorney general, Iñaky Blanco, recently pointed to El Choky as chief of the Guerreros Unidos (Warriors United) gunmen, and the one responsible for ordering the massacre and disappearance of the youths last September 26, after the attack on them from police and gunmen. The criminal climate denounced in the narco-message is not exclusive to Iguala and to seven municipal presidencies of Tierra Caliente. The kind of relationship between Mayor José Luis Abarca, his local police and organized crime, uncovered with the massacre of last September 26, is present in many Guerrero municipal governments. We’re dealing with a relationship that also involves important local politicians, state and federal legislators, party leaders, police chiefs and military commanders. Thus, we are able to characterize the existing political regime in the state as a narco-state. Denunciations like El Choky’s run from mouth to mouth among Guerrerans. Business leaders, social leaders and journalists have documented this nexus. Part of the local and national press has published it. In some cases, like in Iguala with the assassination of the Popular Union’s three leaders, formal accusations have even been presented to the relevant authorities. Everything has been in vain. Those who have warned of the extent and depth of the narco-politics in the state have been eliminated and threatened. When the businessman Pioquinto Damián Huato, the leader of the Canaco in Chilpancigo, accused Mario Moreno, the city’s mayor, of having ties with the criminal group (called) Los Rojos, he was the victim of an attack in which his daughter-in-law died and his son was injured. The politicians pointed to have invariably denied the accusations and have explained them as the result of political quarrels, or that they are not responsible for the behaviour of their friends or relatives. They have said that the authorities ought to investigate them and that they are in the most willing to clarify things. But nothing has been done. The pact of impunity that protects the political class has acted together time after time. According to Bishop Raúl Vera, who headed the Diocese of Ciudad Altamirano  between 1988 and 1995, impunity is the most lacerating characteristic of Guerrero and its most important challenge. Its extent and persistence –he points out– encourages crime and the violation of human rights and dignity. But the violence is not only an issue of disputes between political-criminal groups for production centres, routes and plazas. It is also the result of the decision of the behind-the-scenes powers to get rid of opposition social leaders and to offer protection from (State) power to those who liquidate or disappear them. The victims of forced disappearance and extrajudicial executions during the government of Ángel Aguirre are many. The correlation of murders and the detained-disappeared during his administration is enormous. Among many others, the ecologists Eva Alarcón Ortiz and Marcial Bautista Valle; the students Jorge Alexis Herrera and Gabriel Echeverría; the leaders of the Emiliano Zapata Revolutionary Agrarian League of the South, Raymundo Velázquez and Samuel Vargas; the environmentalist Juventina Villa and his son Reynaldo Santana; the Iguala council member, Justino Carbajal; members of the Popular Union Arturo Hernández, Rafael Banderas and Ángel Román; Rocío Mesino, who was the face of the Campesino Organization of the Southern Sierra; campesinos Juan Lucena and José Luis Sotelo, promoters of a self-defence group in Atoyac; the campesino organizers José Luis Olivares Enríquez and Ana Lilia Gatica Rómulo all make up part of it. The narco-politics is not an issue exclusive to the old PRI. Members of various currents within the PRD have been pointed out as part of it. A member of the New Left [current] and president of the state Congress, Bernardo Ortega, has repeatedly been pointed to as the boss of the Los Ardillos group. His father was in prison for the murder of two AFI agents and was executed on being released. Servando Gómez, La Tuta, revealed in a video that Crescencio Reyes Torres, brother of Carlos, state leader of the Aztec Sun [meaning the PRD] and part of Grupo Guerrero , led by David Jimenez, is one of the principal “owners” of laboratories for the manufacture of synthetic drugs, allied with the Jalisco Nueva Generación Cartel. At the same time, Governor Aguirre has repeatedly been linked with the Independiente de Acapulco Cartel. It is said that its leader, Víctor Aguirre, is the governor’s cousin. Of course, the governor, as well as the rest of those accused, have emphatically rejected the links with criminal groups. Despite the multitude of denunciations against mayors and state officials, arrests have been scarce. 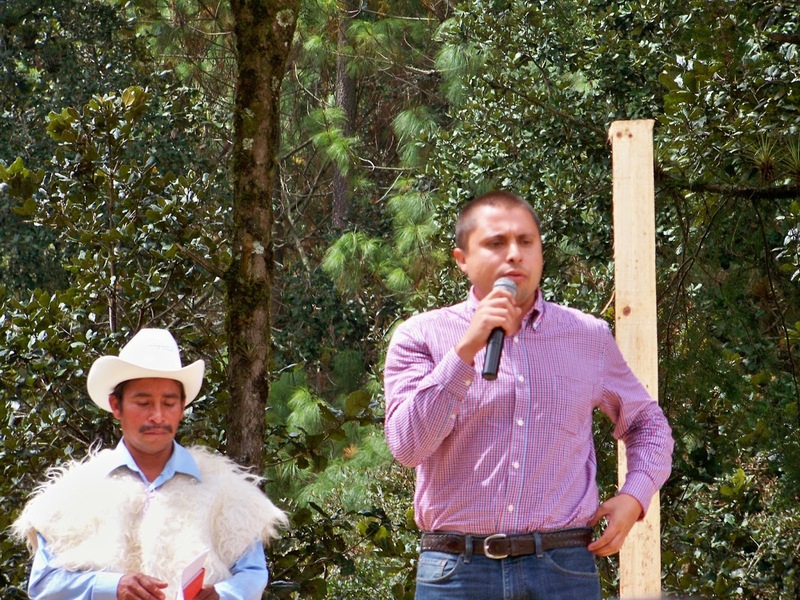 Feliciano Álvarez Mesino, mayor of Cuetzala del Progreso, was arrested for kidnapping and organized crime. He was freed from blame as part of Grupo Guerrero. The official PRI mayor of Chilapa, Vicente Jiménez Aranda, was put in prison for kidnapping. 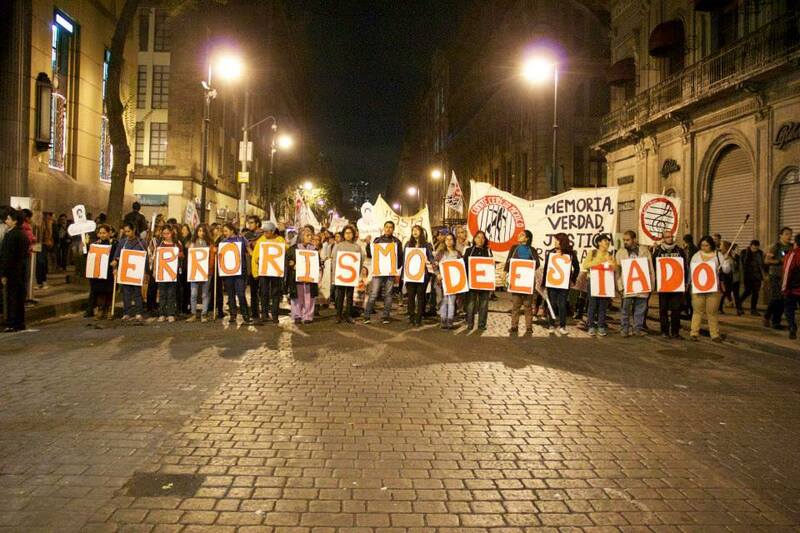 The murder and forced disappearance of the Ayotzinapa students has uncovered the sewer of Guerreran narco-politics. It remains to be seen whether they can put the lid back on. Ciudad Altamirano is a large city on the Guerrero side of the border with the state of Michoacán. Grupo Guerrero is a current, or faction, within the Party of the Democratic Revolution (PRD) in the state of Guerrero. October 23, 2014, at Piccadilly Gardens, Manchester Centre, United Kingdom. A group of 25 people met. 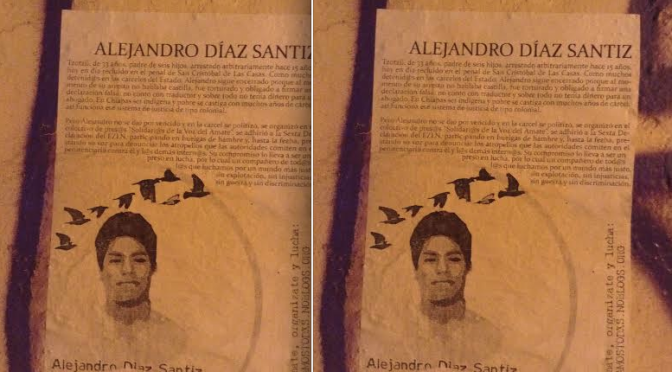 We as Mexicans and non-Mexicans, students and non- students, demand justice for our comrades abducted by the Mexican state. We cried out each name of the 43 missing comrades and we demanded their appearance was imposed in life. Then we took a Solidarity photograph as a sign of our indignation, worthy rage and solidarity with the families and friends of the missing, the murdered, the comrade in a coma and those injured. 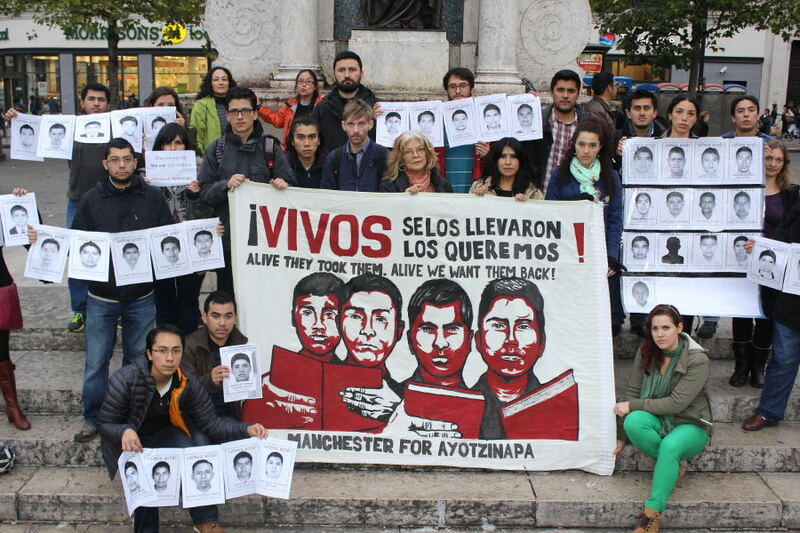 From Manchester, UK, We send Solidarity greeting to Ayotzinapa students, also to all normalistas and teachers part of CNTE. 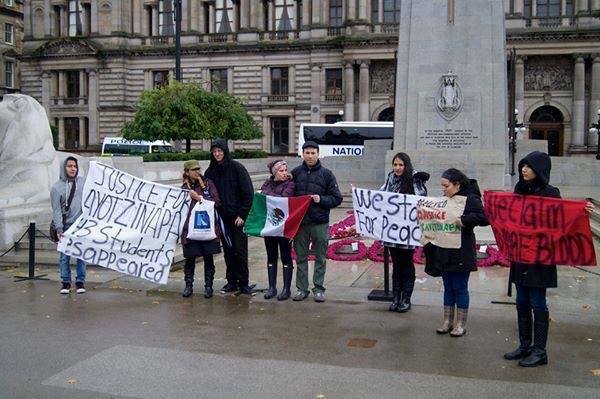 The event was organized by Colectivo Zapatista Manchester, Armadillo Productions in collaboration with students and people shocked for this situation. Photographs: Manchester Zapatista Collective and Armadillo Productions. Indigenous from the Zapatista Army of National Liberation (EZLN) joined the Global Day of Action for Ayotzinapa, and in each of their communities, roads and in their homes, lit candles and marched with banners, to demand the appearance alive of the 43 students from the Isidro Burgos Rural Normal school in Ayotzinapa, who have been forcibly disappeared since last September 26. 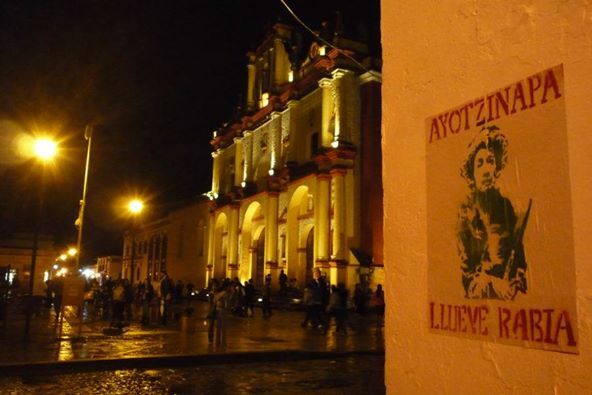 This is the second manifestation by the guerrilla group, who also demanded the unconditional release of the jailed leaders of the Yaqui, Mario Luna Romero and Fernando Jiménez Gutiérrez. “Although small, our light is a way to embrace today those who are needed and whose absence hurts,” they said. Research conducted collectively by Koman Ilel, Kolectivo Zero, Radio Ñomdaa and Más de 131. Polhó, Chiapas. 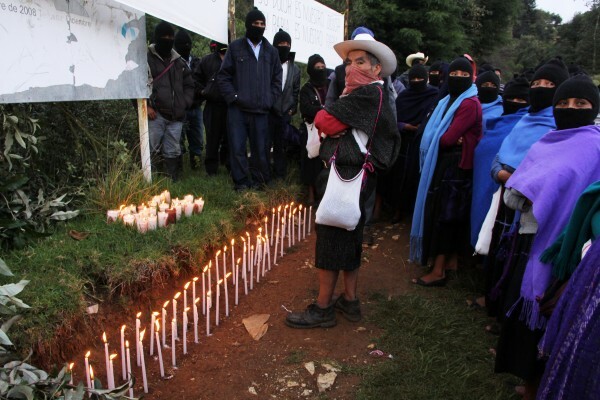 With candles, in silence, men, children and women of the Zapatista Army of National Liberation (EZLN) mobilized again for the students, families and teachers of the rural Raúl Isidro Burgos normal school in Ayotzinapa. As they said in the communiqué released on 19 October, they were “illuminating” the paths, standing on the hillsides in communities in the five regions in which the Zapatistas caracoles are located. When travelling the roads of the region of Los Altos, groups of at least hundred people could be seen in Oventic, Polhó, Acteal and Yabteclum. 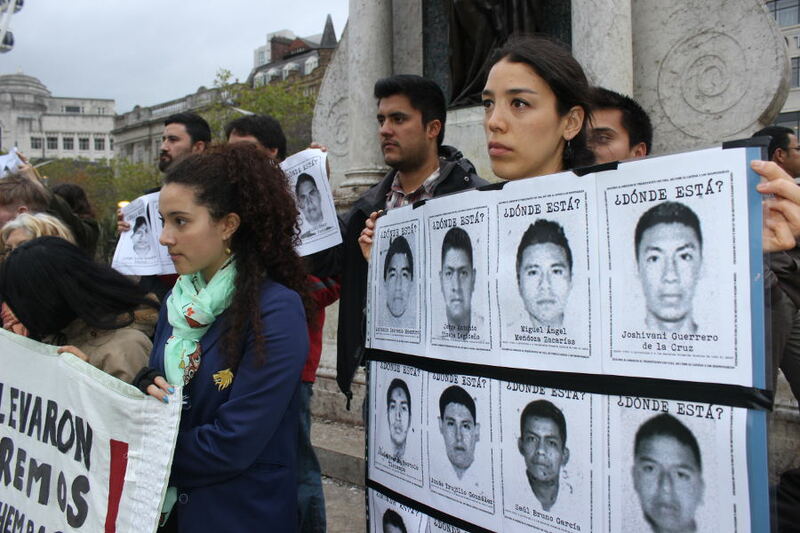 “Presentation alive of the 43 missing students, punishment of those responsible for the killings and the enforced disappearances,” read one of the banners raised in front of the church at Polhó. “We support the students, teachers and relatives of the Raúl Isidro Burgos normal school in Ayotzinapa, Guerrero, Mexico,” read another banner. 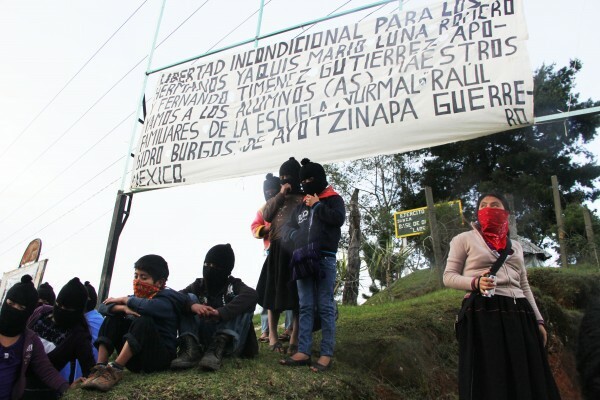 In addition, the Zapatistas also demanded the “unconditional release” of Mario Luna and Fernando Jiménez, indigenous Yaqui prisoners in Sonora opposed to the operation of the Independence Aqueduct, who were arrested in September. “The rich man dreams of extinguishing the first light. 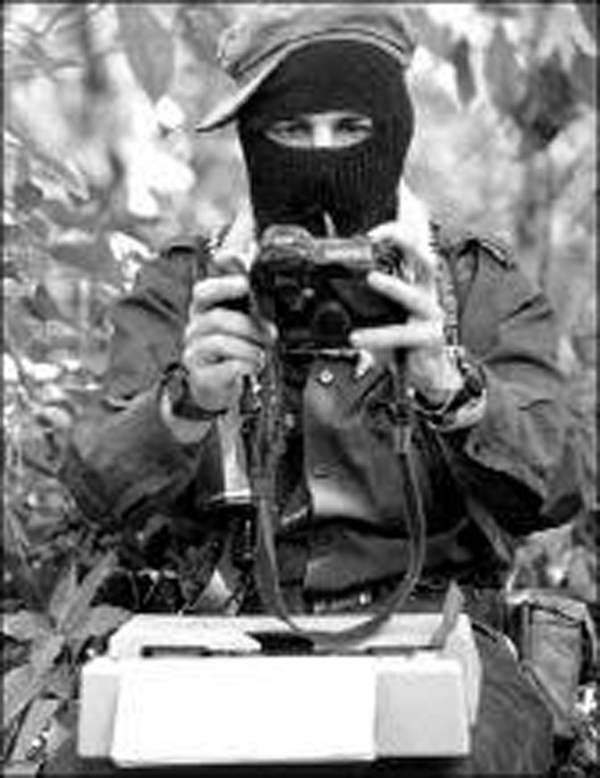 It is useless, now there are many lights and they are all the first” says the Fourth Declaration of the Lacandon Jungle, issued by the EZLN in 1996. Members of the Indigenous National Congress read a declaration in the Zocalo, which was also signed by the EZLN, warning that they will continue mobilizing until the students of the normal school are found and the Yaqui Indians are freed. They branded the Mexican government as a “Narco State” and accused them of using “terrorism” against the population. Also in San Cristobal de las Casas eight thousand people with candles mobilized demanding the safe return of the normal school students. Meanwhile, Las Abejas de Acteal, Tsotsil indigenous adherents to the Sixth Declaration of the Lacandon Jungle, mobilized and issued a communiqué on 22nd October in which they compared the disappearance of the normal school students and the massacre of October 2nd, 1968, with the death of the children from the ABC nursery and the massacre of 45 people who lived among them on December 22, 1997, during the presidency of Ernesto Zedillo. 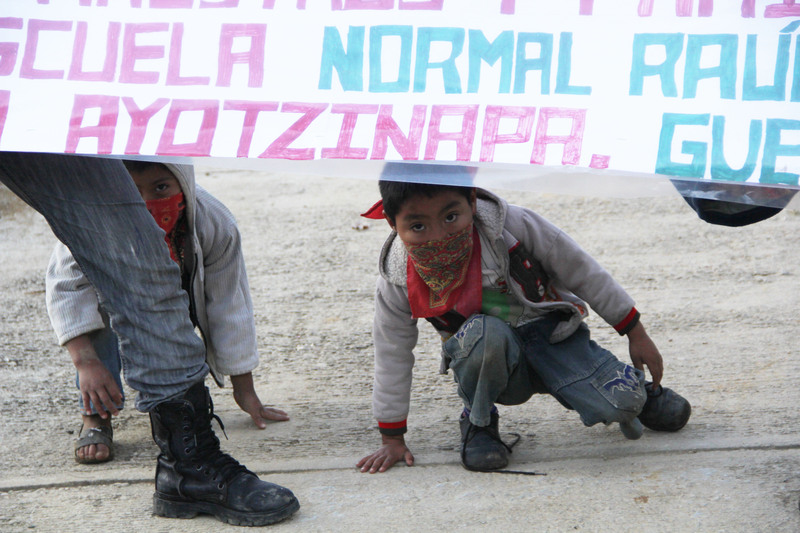 The Ayotzinapa School is an iconic school for elementary rural teachers (that’s what the word “normalista” means, because they are teachers of “escuela normal” which means “elementary school”). So when we say “students,” that is what they are, but they are studying to be teachers. They are mostly indigenous people and peasants. The school is located in the heart of the mountains (the Sierra), in a very, very, very poor rural area. It is iconic because it is where two important teachers in the 60s and the 70s started a guerrilla movement that truly challenged the system. These important guerrilla leaders were Genaro Vázquez and Lucio Cabañas. They were both teachers, and they first organized non-violent civil rights groups demanding social justice, but they became guerrilla leaders because they found out that there is absolutely no way for people to learn how to read and count numbers if they cannot eat, and Guerrero is a very poor state where people literally starve to death while rich tourists in Acapulco and Iztapa celebrate Film Festivals and Book Fairs. (This is not a metaphor: there was a film festival with James Stewart in Acapulco in the 60s while the guerrilleros were killed in the Sierra and now the Governor of Guerrero wanted to go on with his International Book Fair after the massacre of the students). The governors of Guerrero have been always tyrants linked to anti-guerrilla death squads, the Government counter-insurgency “dirty war” and organized crime. Sadly, this is not the first massacre either (Aguas Blancas 1995). What makes it different is that the Governor of Guerrero and the Mayor of the Iguala City were “selected” by the former Mayor of Mexico City, AMLO, the same man who hired Rudolph Giuliani in Mexico City to apply his “Zero Tolerance” plan against crime, and is considered to be a “leftist” and “the hope for the future”. So as you can see, under a capitalist system, these “leftist” leaders who decide to be part of the problem are never part of the solution. The school has a high level of demand each year, with about 600 people applying, but it only has seats for 140 new students each year because the Government has been always willing to close it. It does not close it because it cannot, since the school has a lot of support from the communities. Which explains part of what happened: the students were preparing a rally for October 2, the anniversary of another student massacre (1968), and they were planning to boycott the Mayor’s wife ceremony (her annual report as head of some activities first ladies are assigned to in Mexico, but in this case the wife is also involved in the organized crime). With the permission of the bus drivers, they “borrowed” two buses which they were going to bring back later, as they usually did. This is indeed illegal, but it was also customary and a non-violent action which does not justify what happened next. The Mayor got angry when he learnrd that they were going to protest at his wife’s official ceremony and ordered the Chief of Police to “take care of them”. The police department of that city is so involved in organized crime, that they shot some of them without even arresting them (according to the testimony of two students who survived), then they arrested the rest and handed them to the drug-smuggler assassins to torture and murder them. One of them was flayed. The others were tortured. There are non-confirmed testimonies that the rest of the students were also tortured and their bodies burned. The search for their bodies has also uncovered the existence of many mass graves. Iguala City, where the massacre occurred, is a bridge city for drug smugglers, the main cartel there being named “Guerreros Unidos” (“United Warriors”). All kinds of drugs are sent from there mainly to Acapulco Harbour, but also to other harbours. It is also an area of poppy cultivation. The Movement for Peace with Justice and Dignity, which conducted the caravan of victims of organized crime, led by poet Javier Sicilia (who came here visiting OWS and actually had an action in HSBC Bank), proposes to end organized crime by legalizing drugs. They say it is the only way to stop that spiral of violence, but their proposal is highly criticized by corporate media, because it challenges the capitalist system. 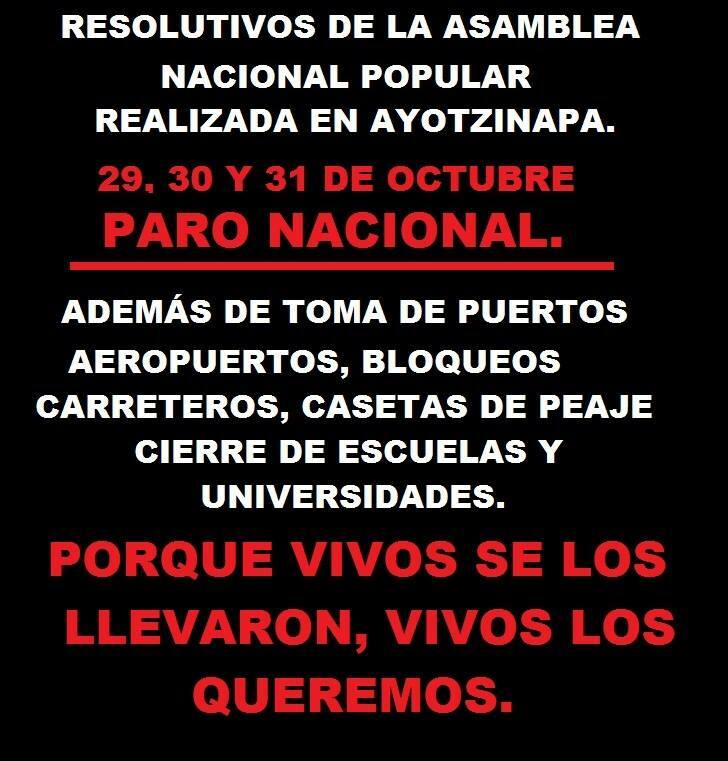 We will continue protesting here in New York this Sunday in Union Square at 3:00 pm and then we will decide what’s next regarding Ayotzinapa and also future actions in NYC against the construction of an airport in Atenco. Lucio Cabañas was eventually found, tortured and killed by the head of the anti-guerrilla police at that time, a CIA agent named Nassar Haro. 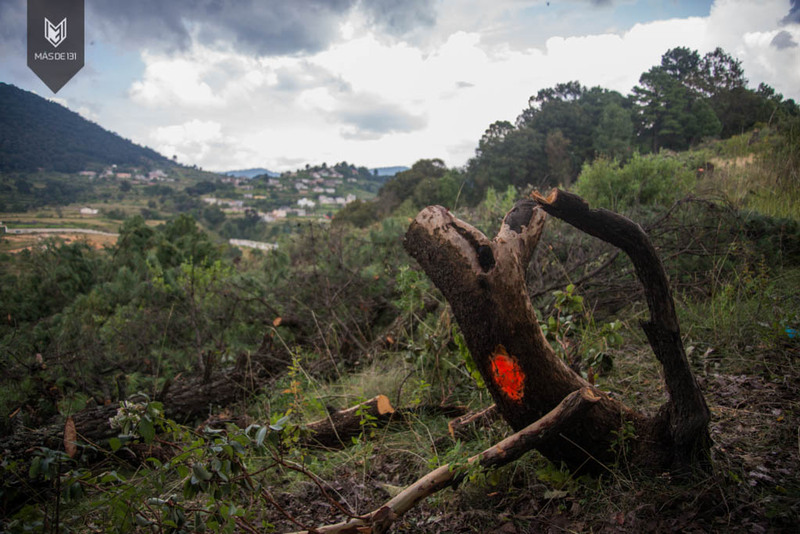 The following information concerns the legal information about the call for protection (amparo) of the comrades of San Sebastián Bachajón (judgement 274/2011) from the dispossession of their land made on February 2nd, 2011. On September 29th 2014, the Third Collegial Court of Tuxtla Gutierrez unanimously revoked (in judgement 224/2014) the cancellation of judgement 274/2011 (a ruling passed down by the Seventh District Judge of Tuxtla Gutierrez, Chiapas), after a complaint lodged by the Sexta adherents of San Sebastián Bachajón. The court subsequently ordered that the case be sent to the Mexican Supreme Court, because of the relevance and transcendence of the issue in terms of the International Right of Indigenous Peoples. The ruling of the Seventh District Judge, José del Carmen Constantino Avendaño, had been revoked because it had been considered to have interpreted the Law of Protection incorrectly with regards to ‘substituted representation’. In the case at hand, the ejidatario Mariano Moreno Guzmán – founder of San Sebastián Bachajón – was an appropriate substitute representative because his legal action sought to defend the collective rights of his fellow ejido members in the face of the Ejidal Commission’s complicity in the acts of dispossession initiated by both the government authorities of Chiapas and of Mexico. These acts had begun on February 2nd 2011, when a police operation (involving around 800 officers) took land (which remains under their control by force and without the consent of the General Assembly of Ejido Inhabitants) with the support of the Ejidal Commission – with the aim of facilitating privatisation of resources and the establishment of a tourism Megaproject. The current issue could be transcendent in importance because, if the actions of the responsible authorities were in fact illegal, the Court would have to proclaim that they had violated fundamental rights – in particular the rights of indigenous communities – and deprived people of their land. It would also have to recognise that these actions were committed under the guise of security and social harmony in the area – where a toll booth had been constructed, along with an emergency response centre of the institute of Civilian Protection of the State of Chiapas. The constitutionality of the actions – justified by the authorisation of an ejidal nucleus – is questioned by the plaintiff, who points out that the authorities carried out the dispossession with the presence of elements of public security forces. Therefore, the Supreme Court would need to clarify up to what point indigenous communities are able to validate such an action. Allegations of violations of the human rights of indigenous peoples to the ownership and possession of their land have been made. The interpretation and application of the Mexican Constitution and numerous international agreements, which protect these rights, must therefore be analysed. Such rulings would also have an impact on similar cases in which, in the name of ensuring social harmony, fundamental and substantive rights of ejidal communities have been affected. The issue of refusal of and lack of access to the justice system for indigenous communities is also relevant to this case, as is the upholding of their right to consultation – their right to give their free and informed consent before any legislative or administrative measure that may affect them is adopted. The case also concerns the right to cultural identity and the protection, use, possession, and enjoyment of their territories. These rights are protected by the Indigenous and Tribal Peoples Convention of the International Labour Organization (ILO-convention 169) and the UN’s Declaration on the Rights of Indigenous Peoples – which was incorporated in Mexico’s constitutional system in the reforms of June 10th 2011. Finding a solution to the conflicts generated by depriving indigenous communities of their territorial rights is of international concern, as is the protection of their human rights in the face of harassment and intimidation by State authorities. However, the plaintiff argues that a dignified and preferential treatment of this issue has not been received from the responsible state and federal authorities. It shouldn’t go unnoticed that, in recent years, numerous reforms have been made to the Mexican Constitution regarding indigenous rights (such as the Law for Dialogue, Reconciliation, and Dignified Peace in Chiapas), along with a series of peace agreements in the state. 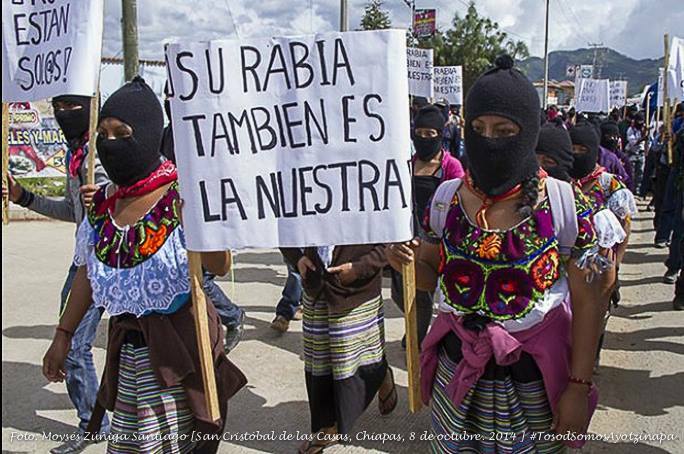 Nor should the fact that indigenous movements with a military character (such as the EZLN) have surfaced in Chiapas be ignored. From the points mentioned above, the case at hand could ensure the creation of orienting criteria regarding the protection of indigenous rights and the effect this has on the implementation of government projects in indigenous areas. Without a doubt, the importance of this case rests in the analysis of the constitutionality of the actions denounced by the plaintiff – which allegedly violate the fundamental rights of ownership, possession, and enjoyment of the ejido lands that he represents. All of the above merits the consideration of the Mexican Supreme Court, because this case represents both a legal question and a constitutional question (in whether or not state authorities can dispossess indigenous people of their territories under the guise of seeking social harmony in said territories). It is necessary to analyse the responsibility of the State in violating human rights by not complying with the appropriate social, political, and economic measures required for the solution of social conflict – especially in the context of a public lack of security and conflicts between communities in indigenous areas. 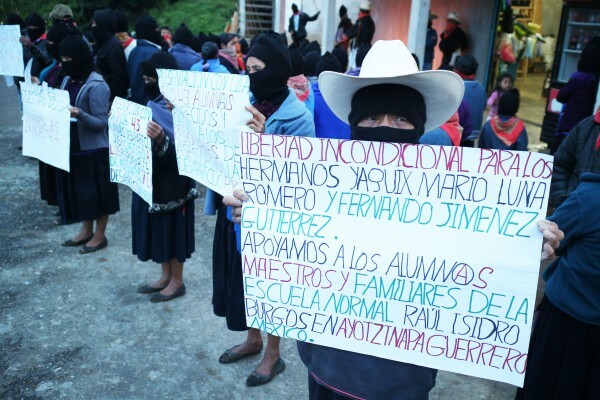 The possible action of the Supreme Court regarding this case would allow for the development of the legal rulings that could benefit the indigenous communities of Mexico. We will keep you informed about the progress of this process.